Situated in Canacona, Roundcube is is a 2-minute walk from Palolem Beach and 3 km from the City Centre. It features free parking, massage services and air-conditioned rooms with a flat-screen cable TV. Modern rooms come with warm lighting and dark wood furnishings. Each is equipped with a personal safe, tea/coffee maker and an en suite bathroom with shower facilities. Select rooms have a balcony. The hotel provides car and bicycle rental services. Staff at the tour desk can arrange for sightseeing and picnic trips. Shuttle services are also available upon request. 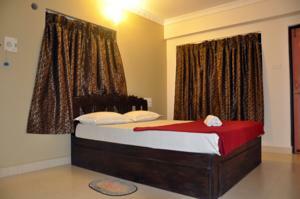 This hotel is a 10-minute walk from a variety of local dining outlets, and a 2-hour drive from Goa Dabolim Airport. Wi-fi is available in the entire hotel and costs INR 40 per hour.